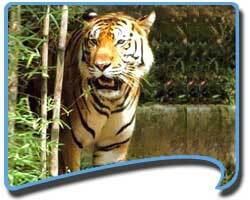 Get information on the city of Corbett National Park, places of tourist attractions, tour packages, How to Reach Corbett National Park and tourist attractions in and around Corbett National Park. One of the highlights of wildlife tourism in India, Jim Corbett National Park has undergone many changes of names. The reserve forest was originally named ‘Hailey National Park’ in 1936. In 1954 it was renamed Ramganga National Park and finally got its present name in 1955 after Jim Corbett, the famous hunter and conservationist who played a vital role in the establishment of this National Park. This famous forest in the state of Uttarakhand in India has the distinction of being the first National Park in India. It was also the venue for the inauguration of project tiger in 1973. Jim Corbett National Park is inhabited by a large number of magnificent animals, plants and birds. The scenic beauty of the park is an added attraction for the tourists visiting this park. The wildlife population of the park includes about 50 mammal species, 25 reptiles, and 580 bird species. The tree species of the forest number around 110. The forests of this region have always been known for their tiger population. Jim Corbett National Park is also one of the first 9 tiger reserves declared at the launch of Project tiger and plays an important role in the conservation of Indian wildlife. Tigers are, therefore the main attraction of this National Park. Besides tigers, the other major animals that are generally spotted here include Elephants, Himalayan black beer, sloth beer, leopard, jungle cat, deer, bison, langurs, and rhesus monkeys. The Gharial and mugger crocodile can be spotted on the banks of the Ramganga River. Sal and Sheesham are the major trees found all over the forest. Bushes, shrubs, and grasslands are also found at many places. The large bird population of Corbett includes resident species like darters, cormorants, herons, and the black necked stork. Winter is the best time to visit the migratory birds that include graylag, bareheaded goose, snipe, grepe, sandpiper, gull and wagtail. Besides the wildlife, Corbett National Park has some places of interest in and around the park. These include the Dhikala Machaan, Crocodile Pool, Getheryo Library, Corbett Museum, Corbett fall, Garjia Temple and the Jim Corbett House. Corbett National Park is a very popular wildlife destination in India. Accordingly, the forest department and other agencies have made ample provisions for accommodation in and around the park. Tourists can choose from the many hotels, rest houses, lodges, and log huts at many places including Dhikala, Sarapduli, Bijarani, and Ghairal. Many resorts offering luxury accommodation have come up along the park perimeters. The Park is kept open from 0600 hours till 1100 hours, and again from 1430 hours till 1730 hours. The timings may change according to season with due notice from the authorities. Air : the nearest international airport is in Delhi at a distance of 300 kilometers from Corbett National Park. Rail : the nearest railway station is at Ramnagar. Moradabad is the nearest major railhead form where trains to various major cities can be boarded. Road : tourists looking to travel by road can avail of the semi deluxe services operated by the Delhi Transport Corporation. The other options include private buses and taxis from Delhi, Nainital and Ranikhet to Ramnagar. Touristplacesinindia.com offers all inclusive information about Jim Corbett National Park and other tourist places in India.